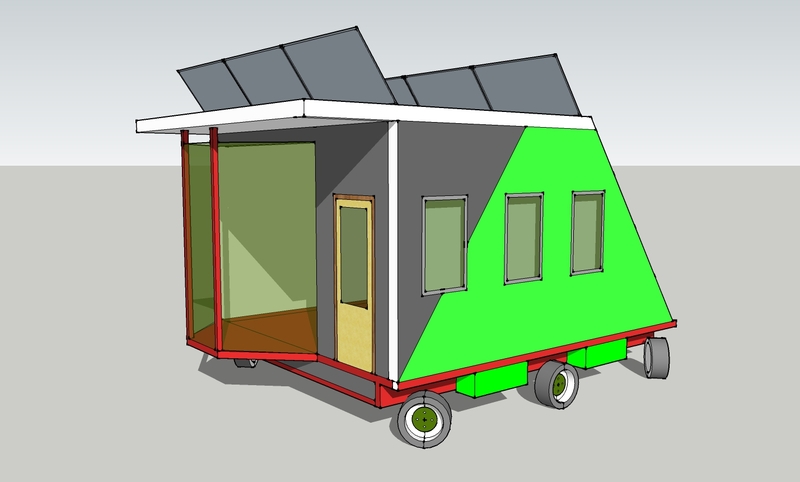 Planners usually allow you to build a pod within the curtilage of your house. This one follows the rules but it comes on wheels. So what’s the point of that? Well for a start there are no foundations to worry about, just a bit of hardstanding will do. Then there is the ability to drive it; 6 powered wheel units (electric or hydraulic) enable you to go for a trundle, down to the pond to watch the sunset for example. Steering is done from the glazed conservatory at the front or from outside. 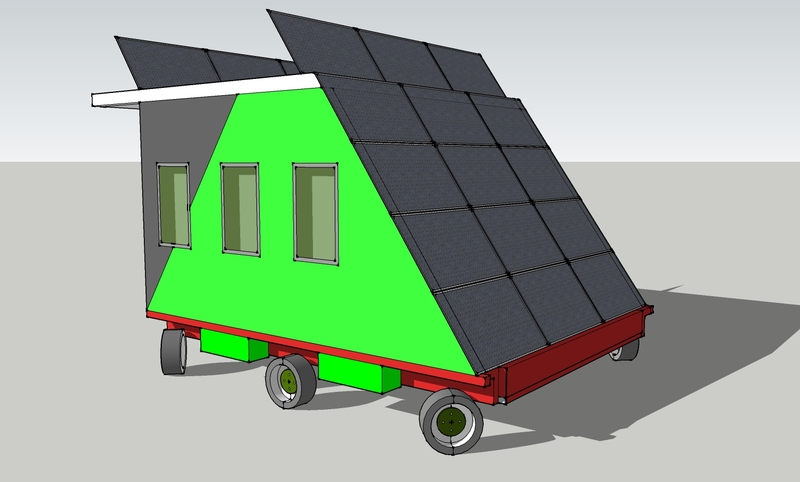 With the wheels steered inwards the whole house can rotate on its axis to track the sun, making full use of the 6kW photovoltaic array. So yes, it’s all off grid and only needs to dock occasionally to empty some tanks and to refill others. Is it worth all the bother? Absolutely, for rental to eco enthusiasts this is a thrilling bit of kit. Imagine their delight when their pod comes round the corner to pick them up and take them to some lovely spot – all filmed from various points to give them a memento of an amazing experience. You can charge a lot more for that than if you were just offering a shed. If you want to use this on your piece of land you might put a 3-point hitch on the back and call it a tractor – great to sit in a comfy chair while you mow the lawn! N.B. Based on the rules and with proper panel dimensions this is a preliminary sketch to see what it might look like. The wheels could be a bit chunkier. The space invaders look is intentional.